A widely acclaimed tour. Visit Lake Naivasha, Samburu Game Reserve, Elephant Bedroom, Serengeti Area, plus so much more. Depart North America on an overnight flight into Europe. Depart the European city and fly to Nairobi, Kenya, the capital of the country. You are met with a special welcome then transferred to the Sarova Stanley Hotel for an overnight stay. 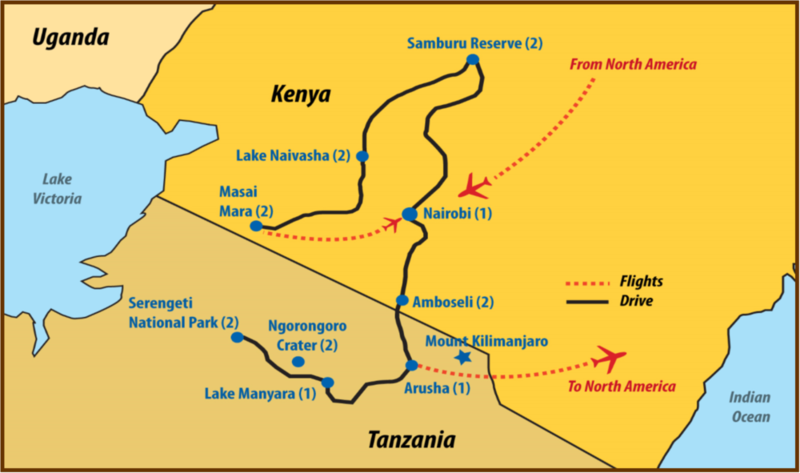 After breakfast, depart Nairobi and drive through the Great Rift Valley to Lake Naivasha. Check into the Lake Naivasha Sopa Lodge for a 2-night stay. Balance of day to enjoy the lodge. Watch for the hippos, giraffes and other animals that come to eat on the lawns in the evenings. This morning, visit one of the many greenhouses in the region and a major supplier of roses to the world. There are over 5,000 acres of greenhouses dotting the countryside near the equator in Kenya. Return to Lake Naivasha lodge for lunch. Later this afternoon take a boat ride on the lake, cruising amidst the many hippos that populate the lake. The boat ride will take you across to Crescent Island- a private sanctuary on a submerged rim of a volcanic crater. A guide takes you onto the island where you wander among a tiny herd of animals such as giraffe, antelope, gazelle, eland, zebra and lots of birds. Today, drive from Lake Naivasha north past Thompson Falls to the Samburu Game Reserve with its unique and fascinating wildlife of the arid north. Check into the Elephant Bedroom Camp for a two night stay. This small and exclusive safari camp is located on the banks of the Ewaso Nyiro River. Here guests are truly at one with nature as the camp is regularly visited by elephant and game which shelter under the trees. Each tented bedroom is nicely furnished in a rustic African style while offering every comfort expected of a luxury safari camp. All tents have electricity and en suite facilities with hot and cold running water. The food and service at Elephant Bedroom Camp are of a high standard. A generous breakfast and lunch (three courses) are served outside when possible. The four course evening meal is either taken by candle-light in the open-front dining area or al fresco. Enjoy your first game drive as you enter the Samburu Game Reserve and make your way to the Elephant Bedroom Camp. This is a full day in the Samburu Game Reserve. There will be both a morning and an afternoon game drive, in search of game found only north of the equator, such as: long necked Gerenuk, Grevy Zebra, Beisa Oryx and the blue shanked Somali Ostrich and of course the Big Five:- Lion, Elephant, Rhino, Cape Buffalo and Leopard. The Ewaso Nyiro River is an oasis-like setting that attracts a myriad of birds and wildlife. There is an optional opportunity to visit a local village after breakfast where guests can learn more about Samburu culture. The evening game drive will take in a scenic point in order to stop for sundowner's and to observe the sun setting over the African plains. Enjoy a morning game drive then return to the Elephant Bedroom Camp for breakfast. Check out of the Elephant Bedroom Camp and depart from the Samburu Game Reserve. Drive past the rich agricultural mosaic of small farms, pineapple and coffee plantations and greenhouses situated near the equator. Stop to visit one of the farms in the region and stop at the Equator for pictures before arriving at the Mount Kenya Safari Club for an overnight stay. With magnificent views of majestic Mount Kenya, the Mount Kenya Safari Club Resort's is set on 100 acres of landscaped gardens. Originally built as the retreat of movie star and Club founder, William Holden, the Club's former members have included Winston Churchill and Bing Crosby. There are many optional activities available including an animal orphanage visit. You may choose just to relax and enjoy the scenery. Depart Mount Kenya Safari Club this morning and drive back to the vibrant city of Nairobi to enjoy a luncheon at the Carnivore –all you can eat– buffet restaurant. This afternoon transfer to the International Airport for the short flight to the Kilimanjaro Airport in Tanzania. Situated at the base of Africa’s highest mountain, the snow-capped Mount Kilimanjaro is the classic Hollywood image of Africa. After clearing Tanzanian Customs, you are met and transferred to the Lake Duluti Serena Lodge for a 2-night stay. The lodge is located in a pleasant semi-rural location on a wooded hillside with glancing views down towards the volcanic crater lake of the same name. Todays visits include some of the farms in the region and learn about the Tanzania farming methods. There is wheat, bananas, avocado etc. that grow here. Return to the lodge for lunch then visit a coffee plantation and learn about the production and processing of Tanzanian coffee. Return to the lodge for the night. Today you travel through the countryside of Tanzania toward the lodge at Lake Manyara which is situated on the rim of the Great Rift Valley. This valley runs all the way from central Africa to the Dead Sea in Israel. Lake Manyara is home to an abundance of bird and wild life, including the tree climbing lion which you may see on an afternoon safari. Spend the night at the lodge. Today you travel toward the famed Serengeti region of the country. This area will have some of the highest concentration of animals in all of Tanzania. You arrive at Lake Masek Tented Camp in time for lunch and check in for a 2-night stay. This exclusive luxury camp is in the Ngorongoro Conservation Area overlooking Lake Masek. This unique location is witness to the Wildebeest Migration which takes place from December to April each year. There is resident Big 5 game all year round in the area as well. There will be an afternoon game drive in the region then return to the camp for dinner and overnight. A full day to enjoy the game viewing and a picnic lunch in the Serengeti, from the migration of the wildebeest to the black- mane lions, cheetahs, elephants and spotted hyena among others. The Serengeti spans approximately 30,000 sq. km and hosts the largest mammal migration in the world, which is one of the Seven Natural Wonders of Africa, and as one of the ten Natural Wonders of the World. Return for dinner and overnight at the camp. Early this morning there is the option of taking a Hot Air Balloon Safari over the Serengeti. Suspended in a basket fixed beneath the rainbow-coloured canopy, you're off for a game-viewing adventure like no other. At the end of the flight, everyone is treated to a champagne breakfast in the bush. Return to camp to pick up those guest that stayed behind and drive to the Neptune Ngorogongoro Luxury Lodge for a 2-night stay. The afternoon is a leisure to relax, use the pools or perhaps enjoy a massage. NOTE: A warm jacket/sweater is highly recommended in this area as evening do get cool. After breakfast, you descend some 600 m onto the spectacular Ngorongoro Crater floor the crater is home to an abundance of wildlife and is a photographer’s paradise. This will be a full day of game-viewing with a picnic lunch in the crater. Ascend from the crater later in the afternoon and overnight at the lodge once more. All to soon your safari has come to an end. Depart this morning and drive into Arusha to the Kia Lodge where a day room awaits you until your overnight flight back to North America via Europe. Today the tour officially ends as you arrive back into North America and home.